Microsoft's tying its services closer together. Microsoft is building deeper ties between Sway, the company’s simplified, web-friendly presentation app, and Windows 10. The latest update to Windows 10's Photos app allows you to upload an album directly into a new Sway project. Once it’s done, all the photos will be ready and waiting in Sway, with each one assigned to its own card. Then you can add captions and any other elements you want in your Sway project. 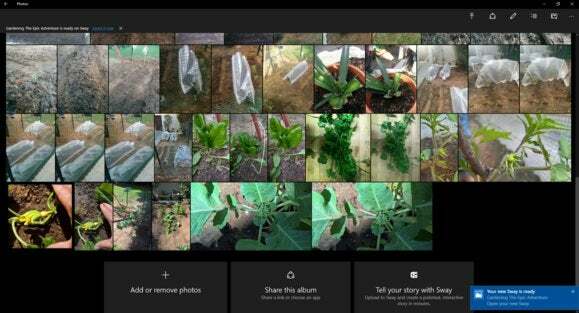 The new Sway integration may also prompt some users to make better use of the Photos app in Windows 10. If you just use Photos the way I do, as a vehicle for viewing my camera uploads on a big screen, the new Sway feature probably won’t show up. The impact on you at home: To call Sway a presentation app isn't quite right since the term conjures up thoughts of PowerPoint. Sway is geared more towards creating tutorials, newsletters, visual journals, and vacation albums to bore your family with. It’s not really what you want when building a slide deck for investors or your next staff meeting. That’s one reason why the Photos integration with Sway will end up being so helpful, since personal photos are often the starting point with Sway. If you want to give the new Sway integration a try make sure to snag the latest Photos app update from the Windows Store.